the joy of sox: Out! Julio Lugo was called out on this second-inning play. Nice call, Doug Eddings! So instead of Boston trailing 3-2 with one out and runners on first and second, with the top of the order coming up, the Red Sox had a runner on second and two outs. Ellsbury then made the third out. While it blunted a rally, it's hard to say the call led to the Sox's loss. At that point they trailed by one run and had seven innings in which to hit. Calls at first bases have been real bad this year. Noticeably I mean. Bad calls usually going against us. Well the run scores on the play either way. But if he's safe, it's tied with two on and one out, and there's a chance we break it open right there--or at least get a lead, which we neevr did get. Who knows, though, maybe suddenly facing a ten-run deficit, Shatner's crew stages one of the great comebacks of all-time. That's why John Sterling aka George Costanza, always says you cannot predict baseball, and I'm not double dipping! I was sitting halfway up the bleachers in center field, and everyone in my section could clearly see that he beat the throw. Totally took the momentum out of a potentially big inning. Just an all around terrible call. Well Eddings definitely needs to have his eyes checked or his brain because once again he makes a horrible call! In the game today between the White Sox and The Rays in the 10th inning it was tied 5-5. When trapped in a run down between 2nd and 3rd, A.J. Pierzynskiof the White Soxs is running back to 2nd, he blatantly elbows and shoves WIlly Aybar as Aybar is trying to get out of the way and instead Eddings called interference on Aybar! 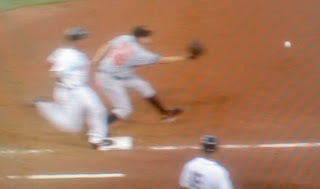 Piersynski got the advance to 3rd and went into home on the next play. This possibly changed the outcome of the game most likely as the Rays ended up losing 6-5 in the 10th inning istead of it being two outs with a runner on 1st. I agree that is is time for Doug Eddings to retire and take up knitting or something.